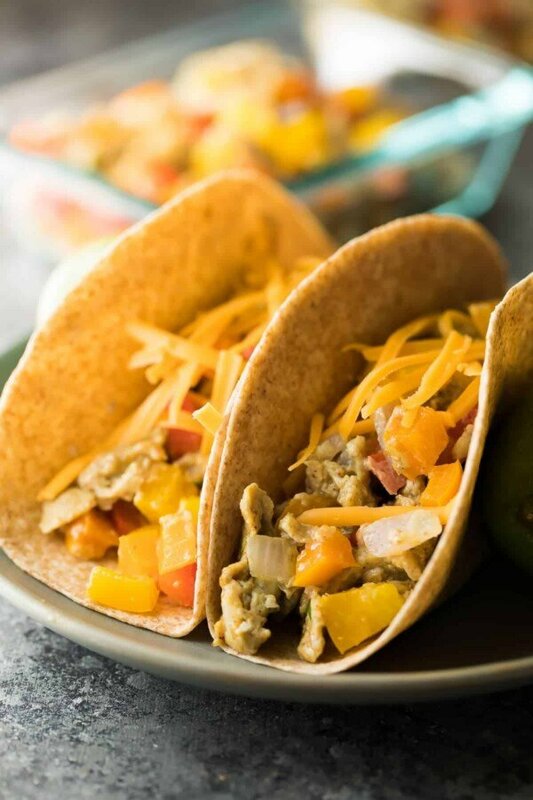 Meal prep veggie & egg breakfast tacos are a healthy breakfast recipe that will energize you and start your day off right! 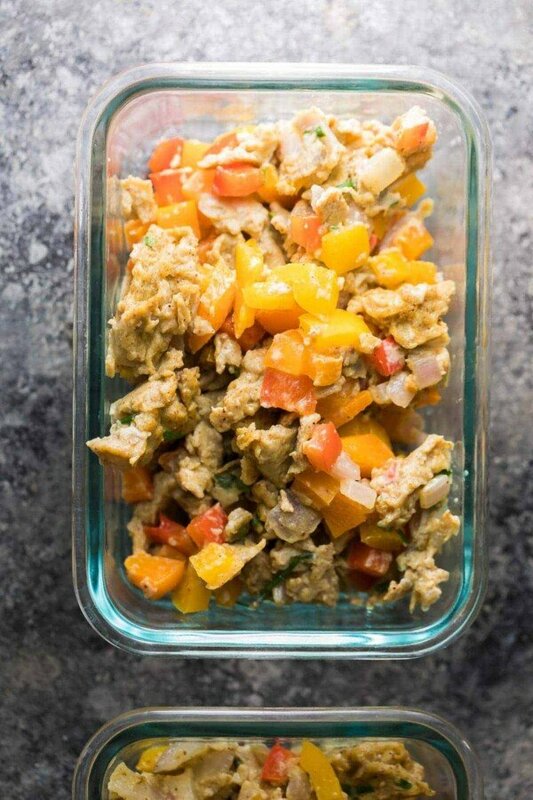 Make the filling ahead on the weekend for four days of breakfasts waiting for you in the fridge. Are you a sweet or savory breakfast person? I have to admit that normally I am a sweet breakfast person…my go-to is a big bowl of berries, yogurt and Cheerios first thing in the morning. But every so often, it’s great to mix up the old routine, and today I’m doing just that with these meal prep veggie & egg breakfast tacos! 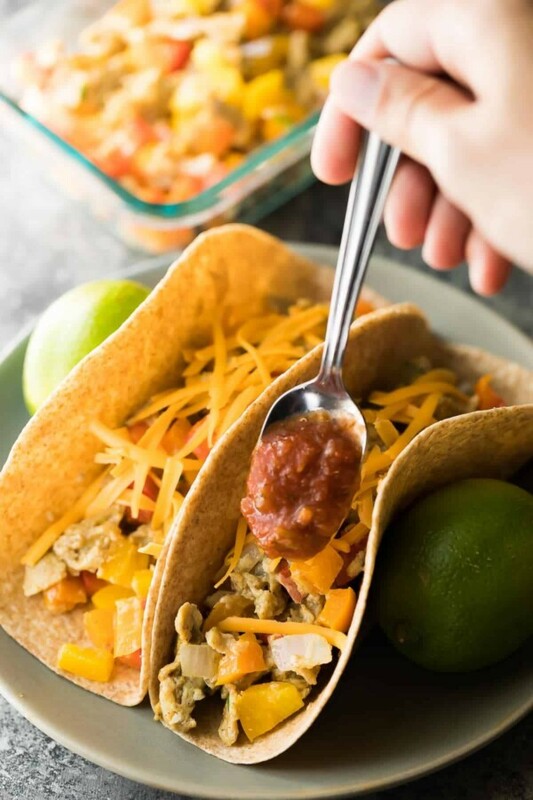 The only real difference with these breakfast tacos (versus the burritos & quesadillas) is that you just make the filling ahead of time, which means the prep work is super fast. So this is definitely a great option for those meal prep Sundays when you are short on time. I loaded my eggs up with veggies: bell peppers and onions this time, but you could absolutely switch it up and use zucchini, chopped cauliflower, kale, spinach, you name it. I added some ground cumin and chili powder to the eggs which kind of made them turn a slightly unappetizing color, but gives them amazing flavor. I also added some chives, fresh from the garden. Hands up if you love having fresh herbs at your fingertips! I wish I could all year round. Guess what? 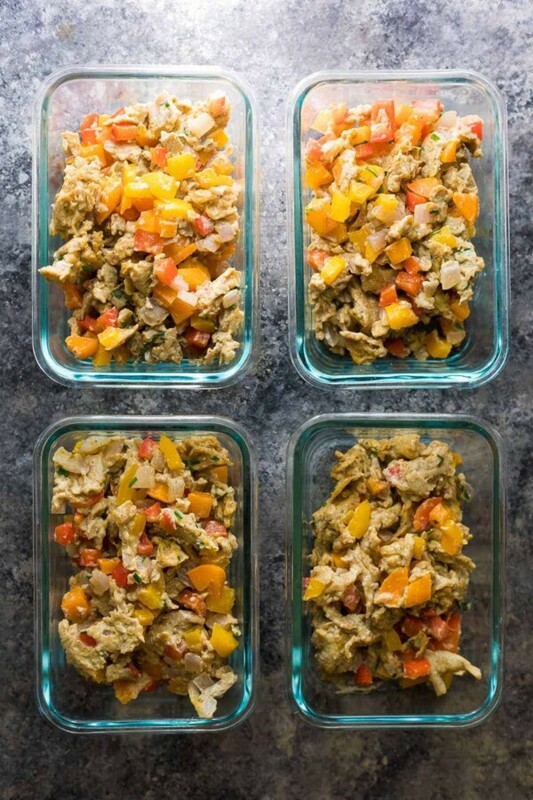 Not only are these meal prep veggie & egg breakfast tacos fridge friendly for 4 or so days, but they freeze well also! That means you can stash a couple of these in the freezer and mix it up for your breakfast routine. Go absolutely nuts when topping your tacos. I added some salsa and shredded cheese but you could add fresh tomatoes, avocados, herbs, cotija cheese, you name it. We loved ours heated up slightly in the microwave. Bon appetit! In a large non-stick pan, heat olive oil over medium heat. 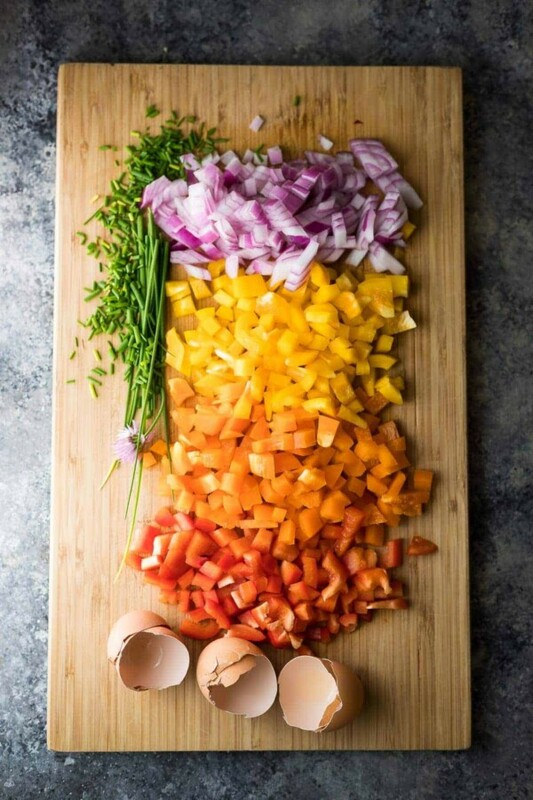 Add the bell peppers and onions and cook, stirring occasionally for 5 minutes, or until soft. 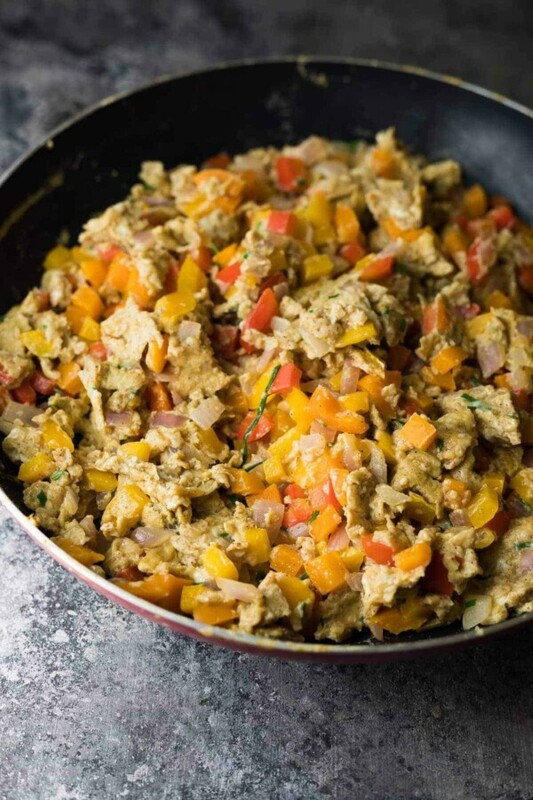 While veggies are cooking, beat eggs together with cumin, chili powder, salt and chives. Add the eggs to the veggies and cook for 4 or so more minutes, until cooked through. Remove from heat. Portion out into 4 2 cup capacity storage containers. 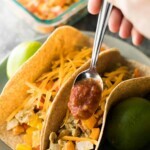 To serveRe-heat eggs in the microwave if necessary, then scoop into a 6 inch flour tortilla. Top with shredded cheese and salsa. I’m an absolute fool for: love, and breakfast tacos. Not necessarily in that order. These look incredible! I make these as omelettes quite frequently – but hadn’t thought of adding the cumin and chilli powder though. And I hadn’t thought of making lots more in advance for the next day ahead. I’ve just made them each day for myself, but this looks easier. But that’s why I am on here, to get new ideas. If I have avocado, I will always slice some in there, it’s delicious.